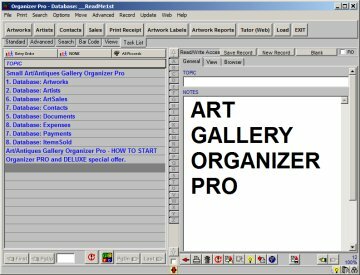 Art Gallery/Art Dealer Software for Windows: inventory database management system for small art galleries and art dealers. Artworks: catalogue and maintain all art and antiques inventories. Artists: enter information about artists. Contacts: track all business contacts (customers, art sources, suppliers,...). Sales: record sale and payment transactions. Expenses: track all your business expenses. Software to create and print labels with texts , barcodes , images , lines, rectangles. Checksum generator for the following barcodes types :EAN13, EAN8, UPC-C , EAN14 , SSCC , ISBN. internal Database ( possibility to import datas from csv files).